"Ventilator" redirects here. For the 2016 film, see Ventilator (film). For other uses of the term "ventilator" in non-medical fields, see Ventilation (disambiguation). Ventilators are chiefly used in intensive care medicine, home care, and emergency medicine (as standalone units) and in anesthesia (as a component of an anesthesia machine). Medical ventilators are sometimes colloquially called "respirators," a term which stems from commonly used devices in the 1950s (particularly the "Bird Respirator"). However, in modern hospital and medical terminology, these machines are never referred to as respirators, and use of "respirator" in this context is now a deprecated anachronism which signals technical unfamiliarity. In its simplest form, a modern positive pressure ventilator consists of an compressible air reservoir or turbine, air and oxygen supplies, a set of valves and tubes, and a disposable or reusable "patient circuit". The air reservoir is pneumatically compressed several times a minute to deliver room-air, or in most cases, an air/oxygen mixture to the patient. If a turbine is used, the turbine pushes air through the ventilator, with a flow valve adjusting pressure to meet patient-specific parameters. When over pressure is released, the patient will exhale passively due to the lungs' elasticity, the exhaled air being released usually through a one-way valve within the patient circuit called the patient manifold. Ventilators may also be equipped with monitoring and alarm systems for patient-related parameters (e.g. pressure, volume, and flow) and ventilator function (e.g. air leakage, power failure, mechanical failure), backup batteries, oxygen tanks, and remote control. The pneumatic system is nowadays often replaced by a computer-controlled turbopump. Modern ventilators are electronically controlled by a small embedded system to allow exact adaptation of pressure and flow characteristics to an individual patient's needs. Fine-tuned ventilator settings also serve to make ventilation more tolerable and comfortable for the patient. In Canada, and the United States, respiratory therapists are responsible for tuning these settings while biomedical technologists are responsible for the maintenance. Noninvasive methods, which are adequate for patients who require a ventilator only while sleeping and resting, mainly employ a nasal mask. Invasive methods require intubation, which for long-term ventilator dependence will normally be a tracheotomy cannula, as this is much more comfortable and practical for long-term care than is larynx or nasal intubation. Because the failure of a mechanical ventilation system may result in death, it is classed as a life-critical system, and precautions must be taken to ensure that mechanical ventilation systems are highly reliable. This includes their power-supply provision. Mechanical ventilators are therefore carefully designed so that no single point of failure can endanger the patient. They may have manual backup mechanisms to enable hand-driven respiration in the absence of power (such as the mechanical ventilator integrated into an anaesthetic machine). They may also have safety valves, which open to atmosphere in the absence of power to act as an anti-suffocation valve for the spontaneously breathing patient. Some systems are also equipped with compressed-gas tanks, air compressors, and/or backup batteries to provide ventilation in case of power failure or defective gas supplies, and methods to operate or call for help if their mechanisms or software fail. The early history of mechanical ventilation begins with various versions of what was eventually called the iron lung, a form of noninvasive negative pressure ventilator widely used during the polio epidemics of the 20th century after the introduction of the "Drinker respirator" in 1928, the subsequent improvements introduced by John Haven Emerson in 1931, and the Both respirator in 1937. Other forms of noninvasive ventilators, also used widely for polio patients, include Biphasic Cuirass Ventilation, the rocking bed, and rather primitive positive pressure machines. In the United Kingdom, the East Radcliffe and Beaver models were early examples, the latter using an automotive wiper motor to drive the bellows used to inflate the lungs. Electric motors were, however, a problem in the operating theatres of that time, as their use caused an explosion hazard in the presence of flammable anesthetics such as ether and cyclopropane. In 1952, Roger Manley of the Westminster Hospital, London, developed a ventilator which was entirely gas driven, and became the most popular model used in Europe. It was an elegant design, and became a great favourite with European anesthetists for four decades, prior to the introduction of models controlled by electronics. It was independent of electrical power, and caused no explosion hazard. The original Mark I unit was developed to become the Manley Mark II in collaboration with the Blease company, who manufactured many thousands of these units. Its principle of operation was very simple, an incoming gas flow was used to lift a weighted bellows unit, which fell intermittently under gravity, forcing breathing gases into the patient's lungs. The inflation pressure could be varied by sliding the movable weight on top of the bellows. The volume of gas delivered was adjustable using a curved slider, which restricted bellows excursion. Residual pressure after the completion of expiration was also configurable, using a small weighted arm visible to the lower right of the front panel. This was a robust unit and its availability encouraged the introduction of positive pressure ventilation techniques into mainstream European anesthetic practice. The 1955 release of Forrest Bird's "Bird Universal Medical Respirator" in the United States, changed the way mechanical ventilation was performed with the small green box becoming a familiar piece of medical equipment. The unit was sold as the Bird Mark 7 Respirator and informally called the "Bird". It was a pneumatic device and therefore required no electrical power source to operate. Intensive care environments around the world revolutionized in 1971 by the introduction of the first SERVO 900 ventilator (Elema-Schönander). It was a small, silent and effective electronic ventilator, with the famous SERVO feedback system controlling what had been set and regulating delivery. For the first time, the machine could deliver the set volume in volume control ventilation. 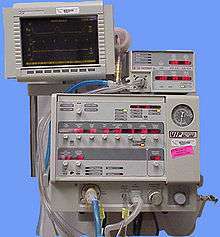 Wikimedia Commons has media related to Medical ventilators. 1 2 Geddes LA (2007). "The history of artificial respiration". IEEE Engineering in Medicine and Biology Magazine : the Quarterly Magazine of the Engineering in Medicine & Biology Society. 26 (6): 38–41. doi:10.1109/EMB.2007.907081. PMID 18189086. ↑ Russell WR, Schuster E, Smith AC, Spalding JM (April 1956). "Radcliffe respiration pumps". The Lancet. 270 (6922): 539–41. doi:10.1016/s0140-6736(56)90597-9. PMID 13320798. ↑ Bellis, Mary. "Forrest Bird invented a fluid control device, respirator & pediatric ventilator". About.com. Retrieved 2009-06-04. ↑ Skinner, M (1998). "Ventilator function under hyperbaric conditions". South Pacific Underwater Medicine Society Journal. 28 (2). Retrieved 2009-06-04. ↑ Weaver LK, Greenway L, Elliot CG (1988). "Performance of the Seachrist 500A Hyperbaric Ventilator in a Monoplace Hyperbaric Chamber". Journal of Hyperbaric Medicine. 3 (4): 215–225. Retrieved 2009-06-04.